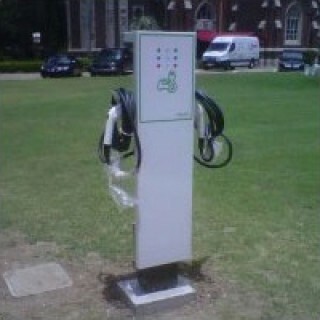 A dual-charging station, which allows two cars to be charged simultaneously, was installed in the horseshoe on the main campus and became operational in mid-June, while a single charging station was added to the Broadway Campus, located across the street from the College of Law in the Pine Street parking lot. The charging stations complement Loyola’s commitment to sustainability initiatives, which include applying energy efficient and environmentally friendly design in new construction projects on campus and a car sharing program. Upon completion, all new and upcoming construction will seek Leadership in Energy and Environmental Design (LEED) certification, which contains guidelines that monitor energy output, indoor environmental quality and water efficiency. Recent projects that will seek LEED certification include the newly-renovated Thomas Hall on main campus and the new law building on the Broadway campus, the former Dominican Conference Center. Additionally, the upcoming renovation and redesign of the Monroe Hall Science Building will also seek LEED designation. 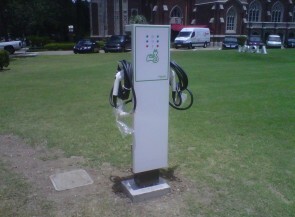 Another green initiative includes the WeCar car sharing partnership with Tulane University which features the use of Toyota hybrids as a way to provide eco-friendly, cost-effective and convenient transportation solution to students, faculty and staff of both universities who enroll in the program. To read more about the electric vehicle charging stations, visit the Construction Notes page on the homepage of Loyola’s website.